I am really happy with my step ladder pot of Proven Winners Diamond Frost. It started out small in June. 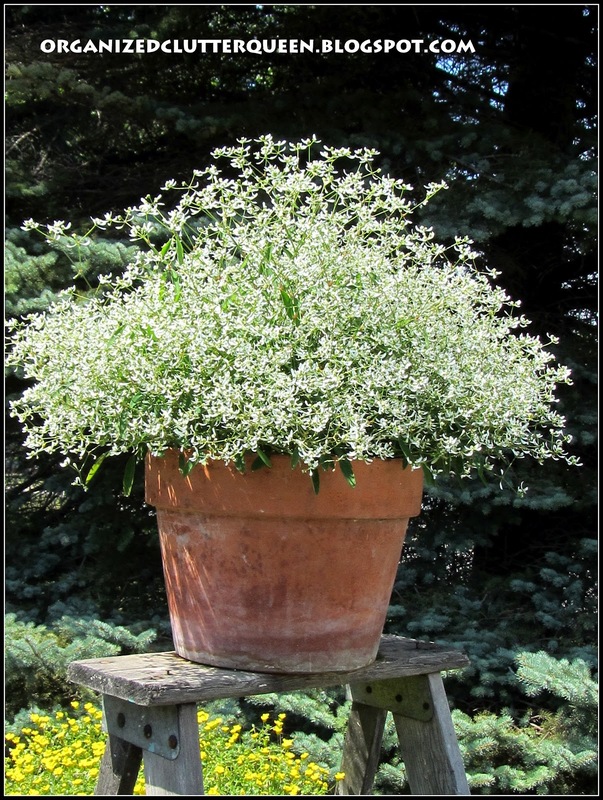 And in late July becoming a cloud of small white flowers. The lantana in the funnel planter wasn't even blooming in early June. In early July filling in. In late July covered in blossoms. My lunch box with Proven Winners Gold Dust was pretty small in June. Filling in nicely in early July. This is my first year planting these. This is the view from the front of the step ladder. The rusty bottle capper planting started with school colors, purple and gold for graduation, but violas couldn't take the heat. A coleus and alyssum take their place. My first blossom this year on my perennial white pincushion flower. Liking the dianthus in tea kettles! Especially the white and red. Just coming into bloom the tall Rudbeckia Golden Glow. 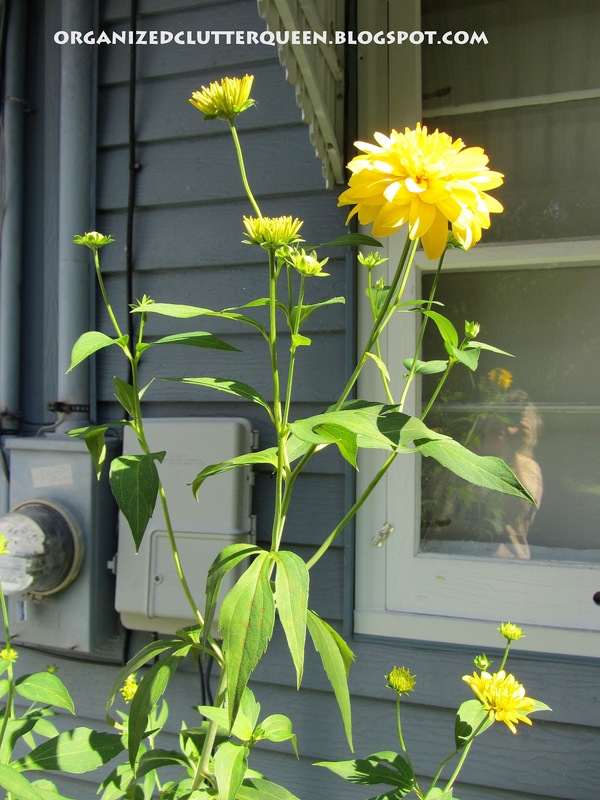 They are sometimes called the "outhouse flower", because they grow so tall they will cover the outhouse. 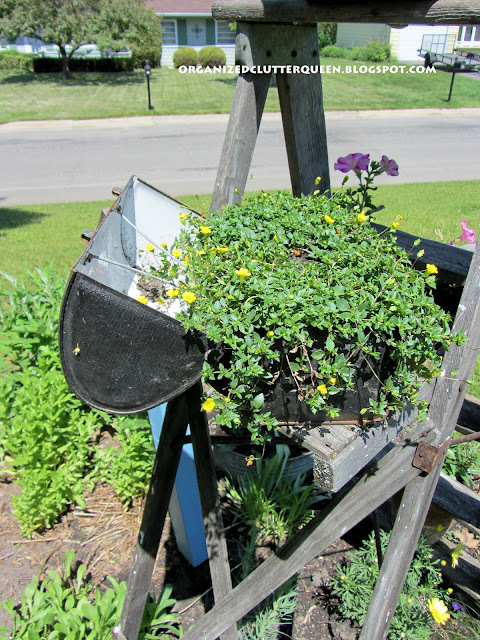 I like to cover the electrical boxes on the back of the house but they are not as tall this year. 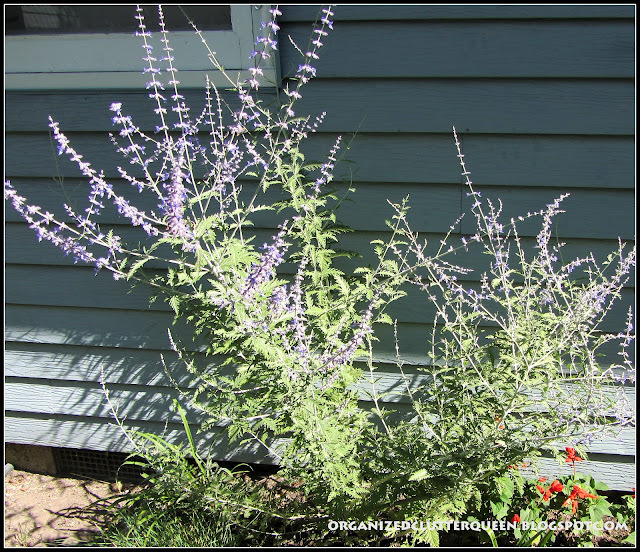 Some of my taller perennials planted with this Russian Sage did not make it through the winter. What a wild and wooly plant I have here! I purchased this last year locally at the Tattered Angel. 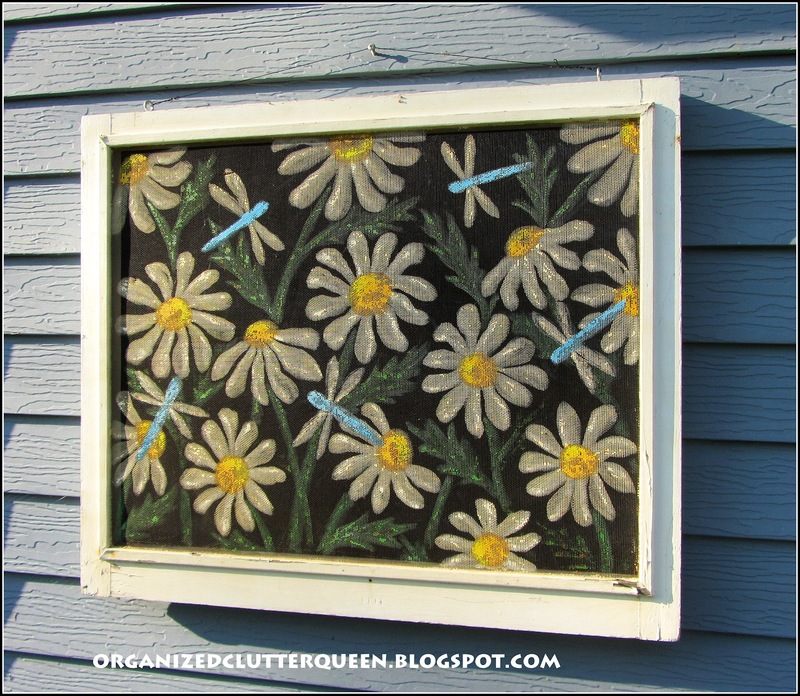 Beautiful daisies and dragonflies painted on an old window screen. It hangs on the front side of my house. I always like to talk flower gardening, I hope you like to hear about it! Remember that my Ramsign house number sign giveaway is still going on here. You certainly do have a green thumb! 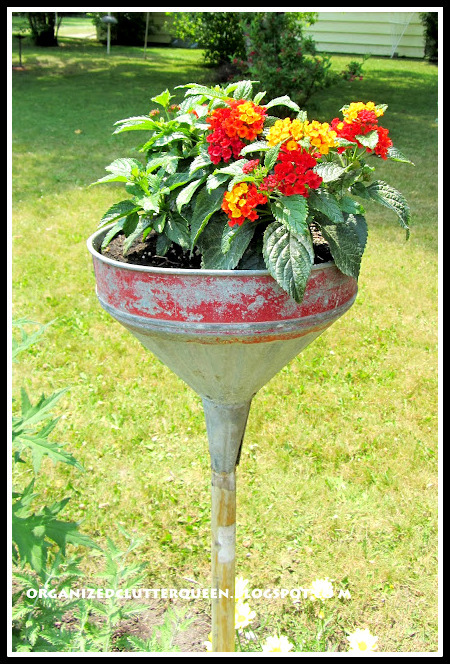 I like your planting ideas. Everything is so green and well-taken care of. 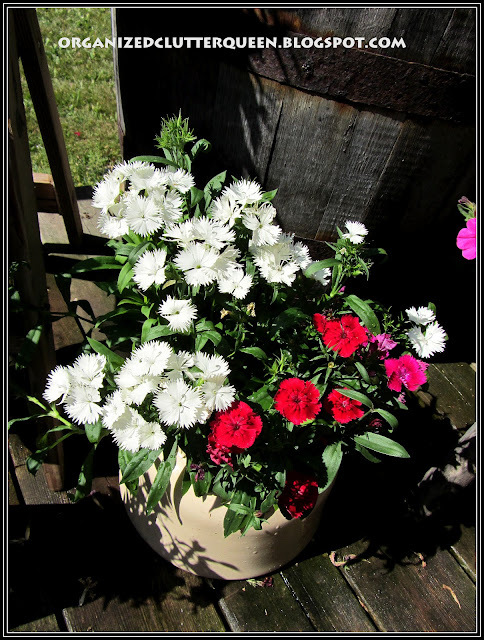 Lovely blooms and lovely pics! Wow Carlene, your plants and planters all look fabulous! But my favorite and which gave me a good laugh is the funnel planter! 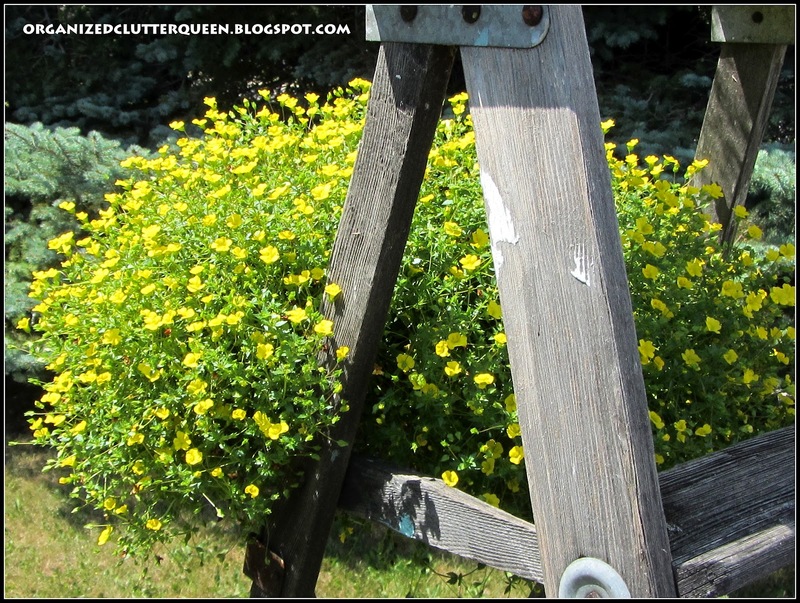 It also goes well with that color of lantana, oh i am so thrilled to do that too! Have you ever got the green thumb girl? Your planters are all thriving. 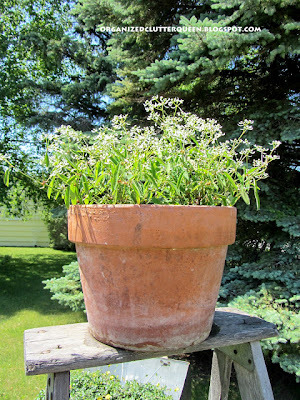 I have planted Diamond Frost for a few years in planters with other plantings, but I have never planted it all by itself. Love how it looks, Oh, and I love the lunch pail. I have my dads old lunch pail and just always used it in the play house. May need to copycat you and plant it next year. Love your cute daisies hanging on your house. 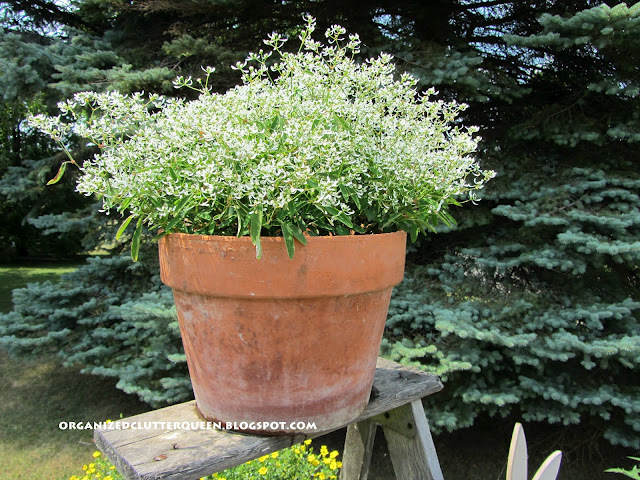 It's so fun seeing all your plants in the unusual and unexpected containers. The funnel is my favorite! 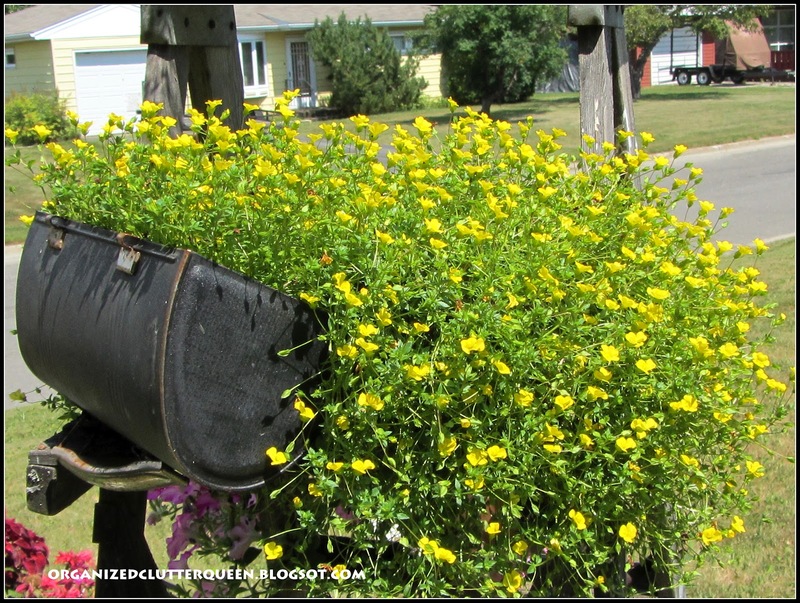 Looks like you've done very well with your flowers this year. Ours are barely hanging on, but I'm hoping they will do like they did last year and come back out in the fall when the weather cools down. Really enjoyed seeing all your plants blooming so well. You do have a good varity. It's just too hot to be outdoors much during the day but I try to early in the mornings. All of your plants look so healthy and BIG! I think I have bugs eating almost all of my plants this year. I love the painted screen!! Wow! So in love with the Gold Dust and Lantana! 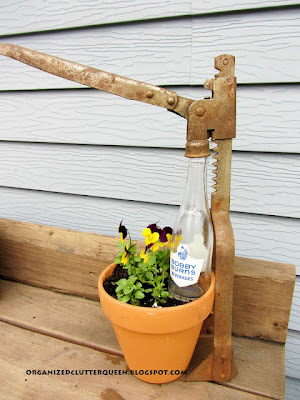 My neighbor used to make her own root beer and used a cap thing like you have in your garden. Brings back many happy memories here. Love your containers and the various flowers. I especially like the funnel planter. Very cute. Your garden is just so fun and unique! 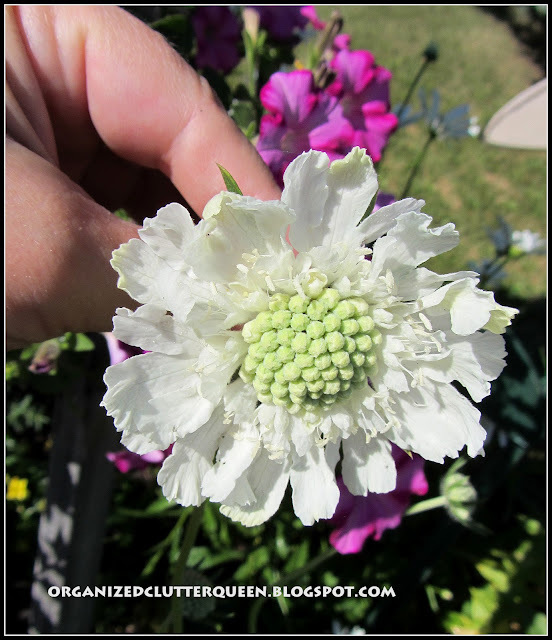 That pin cushion flower is gorgeous! 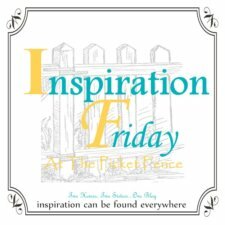 Thanks for sharing at Potpourri Friday! 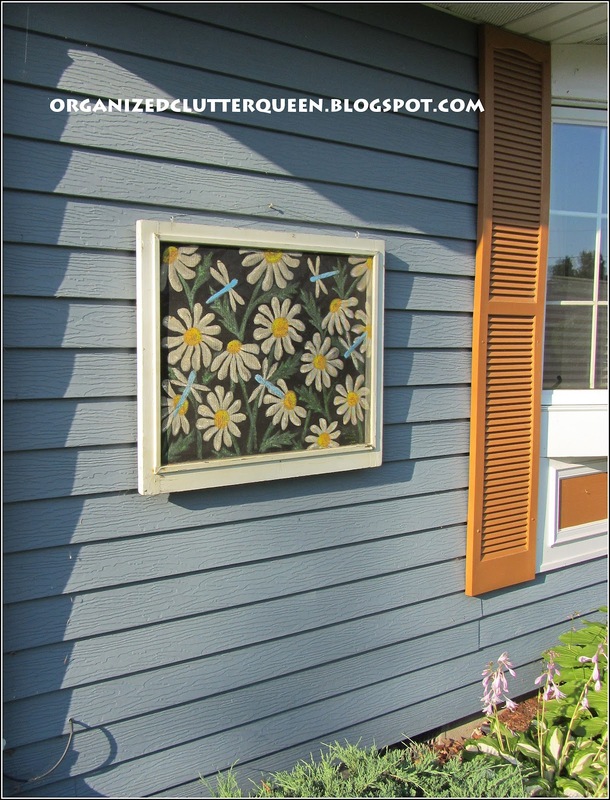 Your flowers are gorgeous, and what a cool painted window screen--I never would have thought to do that! It's lovely. What a wonderful update! I'm so envious. 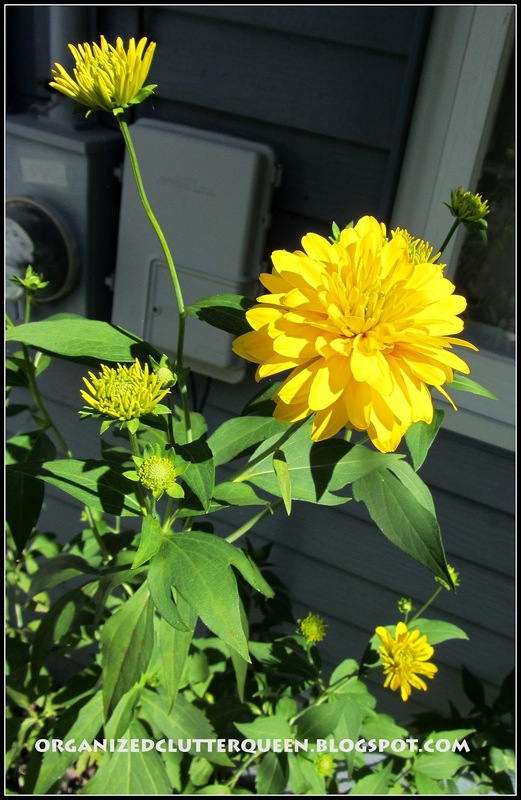 Our drought and extreme heat has really hurt anything that was growing and blooming. 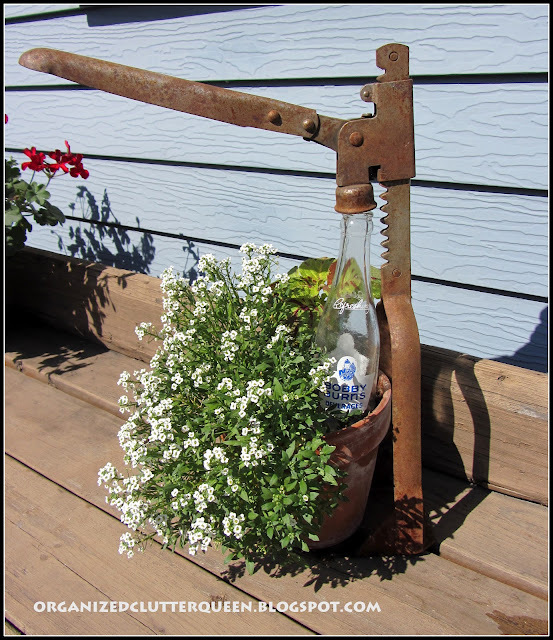 Love the way you use "junk" for your flowers. Looks great! Came over from Rustic Restorations. I wish my flowers looked like this - we are in a terrible drought and only the strong survive. Love the screen idea! I love to hear and see all of your creative planters and beautiful flowers! I wish I was a better gardener! 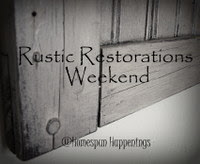 Thank you for linking this up to Rustic Restorations Weekend! 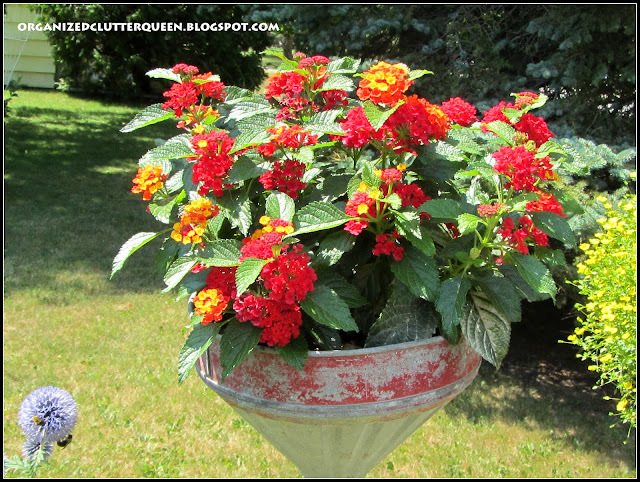 So nice to see your lantana too! I love the dahlieas and the red & white pinks. Lovely! Thanks for visiting! Your flowers are doing GREAT!! 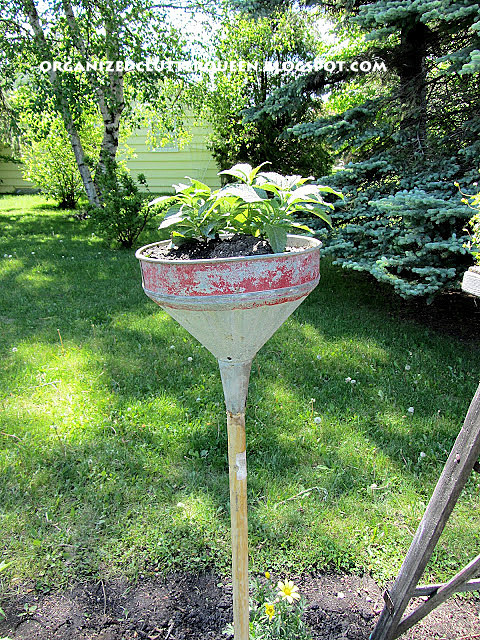 I love all of your creative and unique planters. Beautiful photos! I love the fact that you hang signs and paintings on the outside...perfect! I've never seen a painting on a screen...how cool is that! Your flowers are truly at their best....mine...not so much. Thanks so much for sharing the before and after of your beautiful photos. 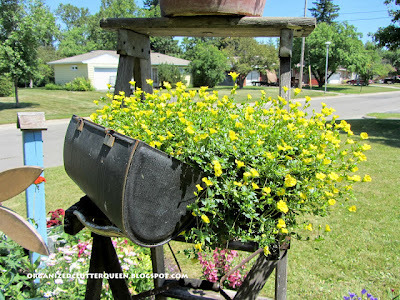 I love all your planters and your garden is gorgeous!